Parts of this article have appeared with the authors approval in an article entitled When PSYWAR Went So Wrong in the October 2012 issue of Vietnam. For six months, the Lao Dong (Communist) Party told of his heroics in prose and song. Young men were urged to emulate the fallen hero. Be had been a model guerrilla. He had joined the Peoples Youth League at an early age and later became a volunteer in the Liberation Army. There were poems, booklets, plays and radio broadcasts telling of Bes death and sacrifice. The communists in the North even wrote an opera for Be. In addition, two statues were erected in his honor. The Viet Cong awarded him the posthumous title of "Indomitable Loyalty and Magnificent Bravery." Quickly! I ask that one of you comrades bring me a detonator and insert it in this mine so that I can sacrifice my life in time! ...[Nguyen Van Be with] two cells of the transport unit were assigned with the mission to convey arms and ammunitions to the front. As they were approaching the Beo Canal of My An village, My An District in Kien-Giang Province, they were encircled by a convoy of 49 enemy armored cars. Following a fierce fighting with the enemy, Nguyen Van Be was captured by them. Afterwards. He was subjected to the most savage torture, and yet they were unable to get anything from him. Finally, they took him along with the captured arms to My An District where they resumed the torture and forced him to explain the handling of various sorts of mines, which he had transported. Be pretended to comply with the order and set about a demonstration session. Suddenly, he seized a mine weighing 10 kilos and shouted: 'Long Live the National Liberation Front of South Vietnam, down with the American Imperialists.' As he stated these words, he rushed like a thunderbolt at the nearest M-118 tank and banged the mine against it. The explosion set off by the 10 kilos mine triggered a series of explosions as the pile of mines captured by the enemy were ignited and went off. By this act of heroism, Nguyen Van Be sacrificed himself but he had destroyed an M-118 tank and heavily damaged two M-113 tanks, killed and wounded 64 enemies, among them 12 Americans. There is a slight problem with this news story. Nobody recalls an M118 tank in Vietnam. The Communists were probably referring to an M113 Armored personnel carrier. The greatest Communist folk hero to emerge from the Viet Nam war is a skinny teen-ager named Nguyen Van Be, who left his home in the Mekong Delta to join the Viet Cong. Van Bes death is recorded in poem, song and story throughout North Viet Nam and among the Viet Cong. 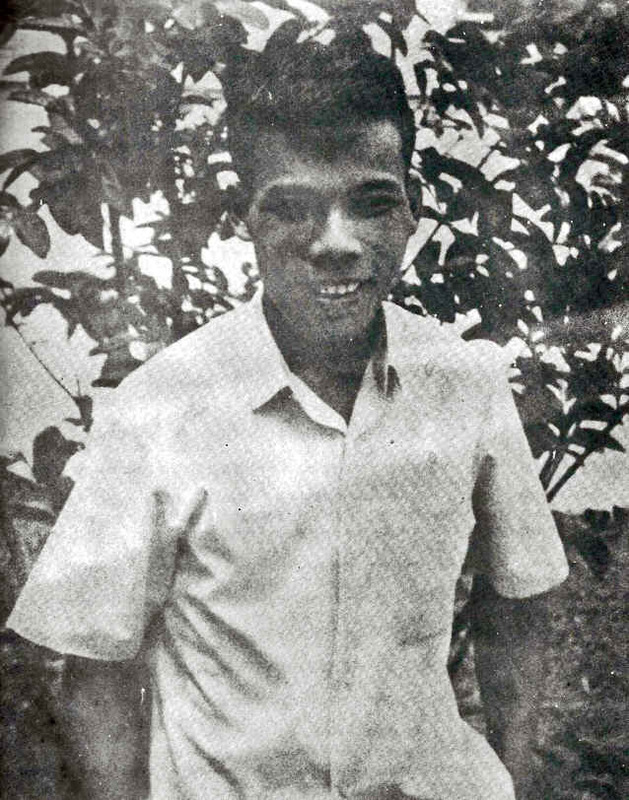 Prompted by Hanoi's radio and newspapers, North Vietnamese schoolchildren compare his deeds to a thousand thunderbolts. His picture, taken when he was a guerrilla, has become a pinup among the Viet Cong, who name squads after him and hold periods of silent meditation to gain strength from his example. The Viet Cong have awarded him a posthumous decoration for indomitable loyalty resoluteness and sublime bravery, and declared that he has shaken an entire region of the country and terrorized the enemies. Earlier this year, his deeds were celebrated at a gathering in Hanoi of an organization called, in the best Communist fashion, "The Anti-U.S. National Salvation Heroes and Emulation Combatants Congress." Just what were the deeds that have made Nguyen Van Be such a hero? As the Communists tell it, he was crossing a canal in the upper delta one day last May in a sampan, together with eleven Viet Cong companions and a heavy load of ammunition, when the sampan was attacked by a squadron of U.S. and South Vietnamese amphibious armored carriers. Nguyen Van Be fought off the attackers for 30 minutes with his rifle and was taken prisoner, covered with mud and blood, only when his ammunition was gone and his companions were all dead. Pretending cooperation with his captors, he then managed to pick up a 20-lb. Claymore mine. Raising it over his head, he valiantly shouted, "Long live the National Liberation Front!" and dashed it against the armored carrier, killing 69 U.S. and South Vietnamese troops as well as himself. He stated "We must use our Communist spirit in order to defeat the mechanical equipment of the enemy."  Our epoch is an epoch of heroes. As Be has stated, "We cannot perform a major task is when we have a good opportunity we fail to exert the spirit of a hero." And every battle shall be fought as your fought it  forever. For the bridges still stand  they live, swarming with traffic. All this exploded in their face in February 1967. Nguyen Van Be was found alive and well in a Vietnamese prison camp. Be agreed to cooperate with the Government of Vietnam (GVN) and told the true story of his capture in a 13 March 1967 interview. He said that the battle lasted just a few minutes and he had never fired a shot. Instead, he dove into a canal in an attempt to escape, but was captured when a Vietnamese soldier grabbed him by the hair. Surrounded by the armored carriers, the overloaded sampan had immediately begun to list and overturned into the water. When one of their number had been killed, the Viet Cong squad jumped out of the sampan and fled to shore. Be also leaped into the water and was trying to hide himself under the surface when a South Vietnamese soldier grabbed him by the hair and pulled him out. He was the only one taken captiveand he had never got to fire a single shot. The boy was a handsome young man and very polite. By July 1967 JUSPAO had publicized the Be affair for Southern audiences through the production of more than thirty million leaflets, seven million cartoon leaflets, 465,000 posters, a special newspaper in 175,000 copies, 167,000 photographs, 10,000 song sheets, several motion pictures, and numerous radio and television programs featuring Be, his family, and his Hoi Chanh (Viet Cong who had returned to the GVN) friends. Hanoi and the Viet Cong continue to insist that Nguyen Van Be is a martyred hero. They have been seriously hurt by the Government of Vietnam/United States disclosure that the 21-year-old youth is still alive and never committed the act of bravery by which, the Communists say, he sacrificed himself and killed sixty-nine American aggressors and puppet troops. The purpose of this guidance is to review the facts of the Nguyen Van Be case, alert all recipients to Saigon plans for further exploitation, and provide instructions pertaining to local exploitation. 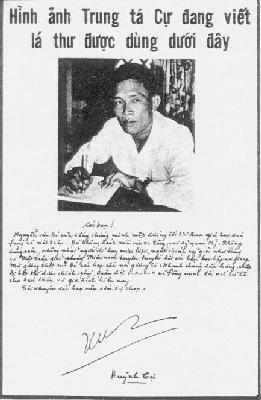 JUSPAO, in cooperation with the Ministry of Information and Chieu Hoi and other GVN agencies, as appropriate, and with the assistance of the PSYOP directorate of MACV, will endeavor over the next few months to utilize Nguyen Van Be to further discredit the communist propaganda apparatus and to weaken their use of hero emulation as a means of inspiring young men in North Vietnam and in the VC-held areas of South Vietnam to become heroic fighters for the VC/NLF cause. 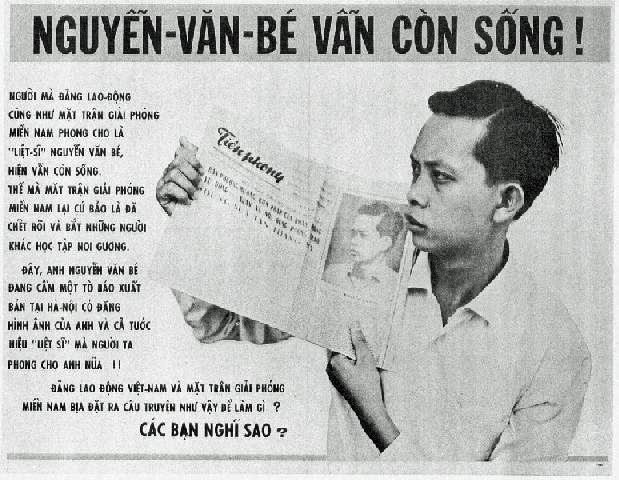 The report goes on to mention 13 leaflets that were prepared for the Be campaign, for example: SP-1774 Poster, Nguyen Van Be Reads about His Own Death, 164, 000 for nationwide distribution; SP-1775 Leaflet, title as above, 6,700,000 for nationwide distribution; and SP-1846 Dead Hero Rejoins His Family," 167, 000 for nationwide distribution. 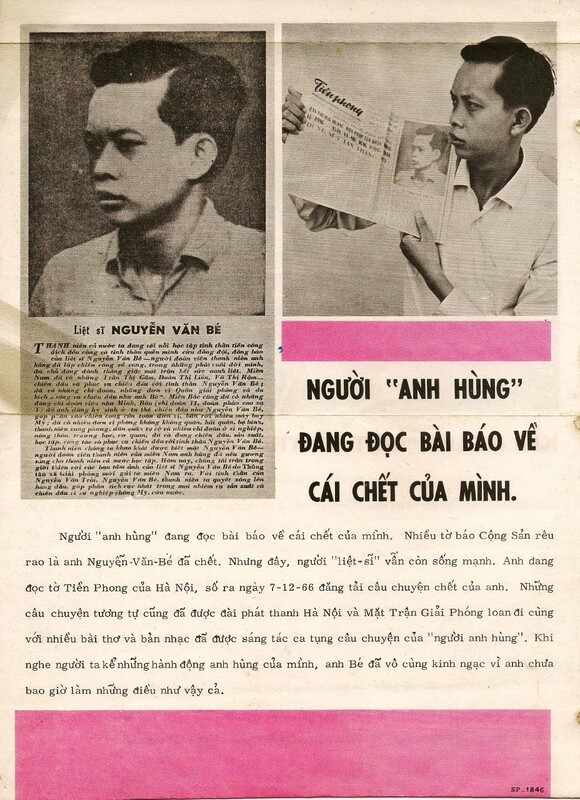 This week the U.S. psychological-warfare teamto which Nguyen Van Be is indeed a herowill begin distributing some 7,000,000 leaflets and 100,000 posters in both South and North Viet Nam showing Nguyen Van Be posing beside Communist newspapers headlining his fictitious martyrdom. More than one-third of the leaflets will be dropped over North Viet Nam, where the government recently erected a statue in downtown Hanoi showing Comrade Be holding his mine overhead at the precious instant of immortality. Illustrated in Van Tac Vu Magazine, Issue No. 11. But the rumor was spread that I have died. For the purpose of propaganda. A tabloid newspaper with the hero's name was produced and distributed nationwide. 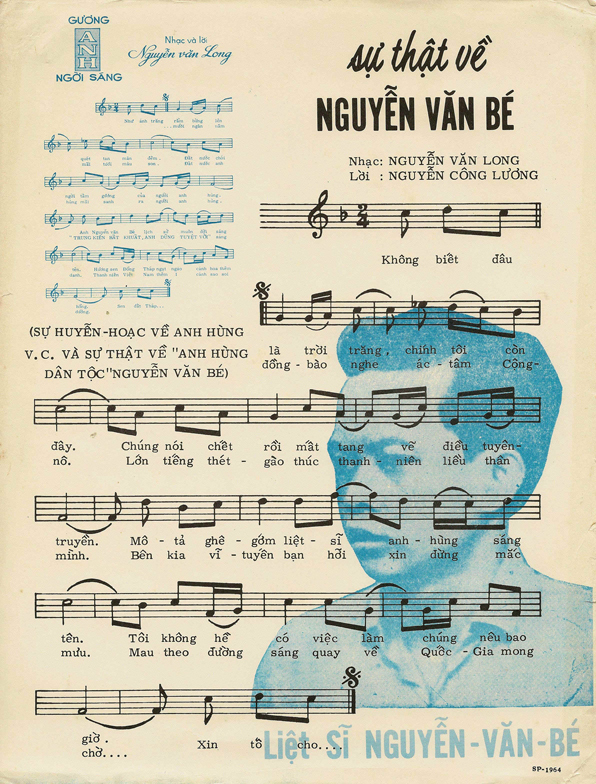 Culture-drama teams, groups of Vietnamese singers and dramatists touring the villages, carried with them 10,000 song sheets espousing 'The truth about Nguyen Van be.' Numerous radio programs featuring Be, his family, and three other defectors were broadcast over VTVN, the Vietnamese government owned and operated network. Plans were laid for a weekly five-minute radio report by Be, reporting his experiences, along with commentary on Vietnamese developments and reactions from the presses of other countries not directly involved in the conflict. Among many leaflets printed, one featured Be's mother, with the caption, "I Ought to Know My Own Son." Be's three defector friends were captioned 'We Knew Too Much' in their leaflet testimonials. Special portable exhibits including photo-panels were produced for display at the provincial and district level. Loudspeaker tape recordings were produced for use on airborne helicopters hovering over the Vietnamese countryside. I am Nguyen Van Be and the Government of North Vietnam claims I died a martyr, but I am still alive in South Vietnam. Nguyen Van Be was perhaps our prize capture of the war. He had been played up by the North Vietnamese regime as one of the great heroes of the war and all of the young men of North Vietnam had been exhorted to emulate his heroism. Hanoi reported that he had been captured, but even during capture had blown up a U.S. tank before he was killed. As it developed, Nguyen Van Be had been captured and our people found him in a Government of Vietnam prisoner-of-war camp. We managed to extract him from the camp, used him as the author of many leaflets which we dropped over North Vietnam and the North Vietnamese forces in South Vietnam. In this output he discredited all that Hanoi had said about him. We arranged for him to meet the press and to appear on radio and TV. Rochlen seated at right. Be second from right. 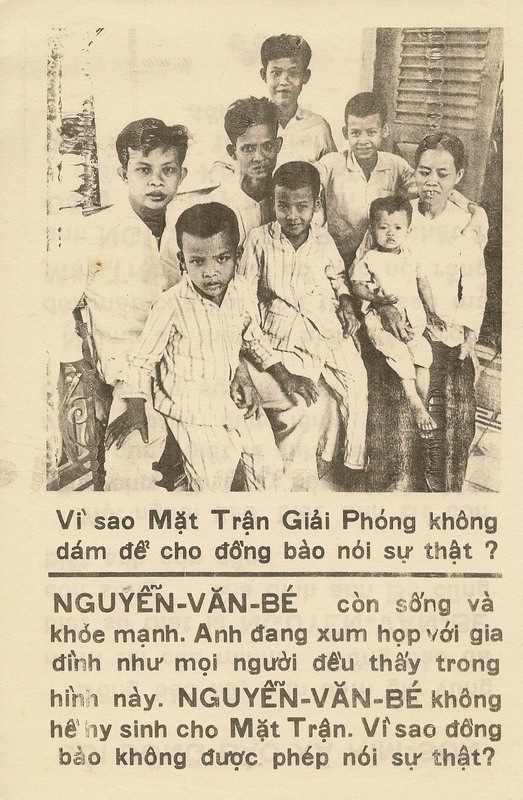 One of my assistants, Don Rochlen, found that Nguyen Van Bes family (father, mother, brothers and sisters) were living in an area where they could be captured by the Viet Cong, in retaliation for Bes anti-Hanoi propaganda. Don proposed that he visit the contested area in which they were living, and with the help of a U.S. Army company enter the area and remove the family from their danger. We were able to gain approval for this project. His father looks very unhappy. Is he scanning the crowd for possible Viet Cong assassins? 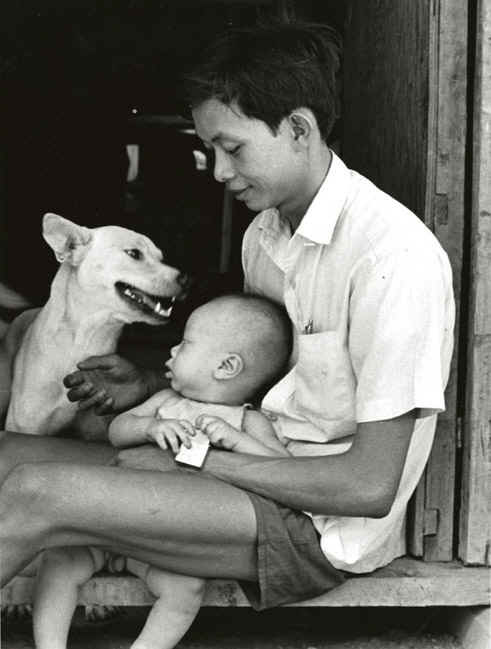 Don did manage to move the family from the dangerous area, placed them on a plane, and traveled with them to Saigon. On that evening I heard a station wagon drive up to my villa. There was Don, with the entire family. He reported that the arrangements he had made with the GVN officials to receive the Be family had fallen through. I offered to keep the family overnight, but insisted that they be moved the next day, since I was due to leave for Bangkok and then go, with my family on home leave. Here I was, with a family that was undoubtedly an important target for the Viet Cong, in my own domicile. I managed to bed them down, stayed up all night, and made several tours of the neighborhood to see whether there were any suspicious characters hanging around. The next morning I fed them (the father, mother and four children) on bacon and eggs. Don did manage, during the day, to get them removed to a safe haven. We plan taped interviews  both short ones for PSYWAR plane use and longer ones for VTVN [Voice of Vietnam] and VOF [Voice of Freedom] use. We want photo coverage including hospital treatment scenes and hand written leaflets.
. When asked if she ever received any aid from the Viet Cong while her son was away or allegedly dead she answered] We received no assistance at all. They didnt give us money, rice or land. Nothing at all. Here we see Be in a pair of fancy American sunglasses. A Vietnamese woman touches his arm. Is she fascinated to meet such a famous celebrity, or is she checking to see if he is really alive as the Americans say or a ghost as the Communists claim? The Communists retaliated against the American propaganda campaign. They simply ignored the Allied propaganda or claimed that it was all an American fabrication. Even though he was clearly alive, they celebrated the anniversary of his death. They continued to write newspaper articles, make films, erected a third statue and published another biography of his life. They simply ignored the fact that he was alive and continued telling their lie repeatedly, believing that if it were told often enough, the people would believe. So far we have made three films. The evaluation panel has seen two of the movies. The first movie was approved unanimously. The second film will have to be edited again. The third movie which includes Cu, Be, Bes mother and Hoi Chanh friends is now being processed in Tokyo. Now we come to future films [the writer mentions two additional well-known Communist Hoi Chanhs that could be placed in a move with Be  Ba Hung (a former guerrilla advisor) and Nguyen Dinh Khoi (a Viet Cong journalist)]. Radio Hanoi attacked the disclosure that Nguyen Van Be was still alive in a program aired 16 March 1967. The title of the commentary was, "A Dirty Psychological Warfare Trick." During the last few days, the psychological warfare organs of the Americans and their lackeys in Saigon employed every propaganda trick to invent a story of the appearance of Nguyen Van Be in their prison before they released the news that Nguyen Van Be had been arrested and is living safe in their claws, without being tortured. The Thieu-Ky clique's psychological warfare minister held a press conference during which a Nguyen Van Be appeared before journalists, who questioned him. There is nothing new in this sensational farce. Any conjuring trick of the Americans and their lackeys is only a repetition of the ridiculous comedy they played when they invented the story of Tran Van Van's assassin, one-eyed man who professed to be a Viet Cong. Taking this experience into account, this time they picked out an intact, good-looking man. They also taught him what to say. They plotted to use time to blur the hero's image so that they could easily deceive the public. But 10 months have not lessened the noise of the Nguyen Van Be bomb, but made it resound more. Brother Be's image has been carved increasingly deeply into the hearts of millions of people. It is necessary to warn that their trick about hero Nguyen Van Be is an insolent offense to all the Vietnamese people. They dared offend an outstanding anti-US national salvation generation. Southern compatriots, south youths, and especially, liberation combatants, comrades of Hero Nguyen Van Be, will surely not forgive them. We will punish them severely. The Lao Dongs (Communist Party) newspaper Nhan Dan went so far as to claim, "It is not necessary to look for Bes replacement in the bulky documents and files of the CIA. Zorthian (Director of JUSPAO) merely resorted to the Hollywood technique of selecting actors and the medical art of changing facial traits as applied in Hong Kong and Japan." The peasants were expected to recognize Nguyen Van Be under the threat of automatic weapons of 800 soldiers from the U.S. 9th Division and South Vietnamese troops and policemen. Use concrete evidence to unmask the treacherous plots of the Americans and Thieu-Ky gang. Prove the truth of hero Nguyen Van Be's attack against the enemy at My An; and the tragic failure of the American attempt to send a fake Be to Kim Son before hundreds of witnessing eyes of the Kim Son inhabitants who all admitted that was a phony Be. Reaction from Radio Hanoi and Liberation Radio was swift and violent. For revealing that Nguyen Van Be was in fact alive, the GVN was accused of "a dirty psychological warfare trick," "sheer knavery," and labeled "mean and insolent." The great campaign of counter-propaganda against the heroic example of Nguyen Van Be has been launched concurrently with operation Junction City...The battle ground was Kim Son village. As reported by the western news agencies, the force of "truth" consisted of 800 men from the 9th U.S. Infantry Division which conducted an operation under the cover of "Nguyen Van Be." This time the phony Nguyen Van Be would succeed in pacifying the genuine Nguyen Van Be. During these last few months the enemy has increasingly spread distorted information about hero Nguyen Van Be...Recently the Saigon Psywar Secretary of State set up a news conference at which gathered the Saigon local and foreign press correspondents, and there presented a young man they called Nguyen Van Be. They have devised the scheme of an interview with Nguyen Van Be by which they have spread their distorted propaganda in order to cheat public opinion. 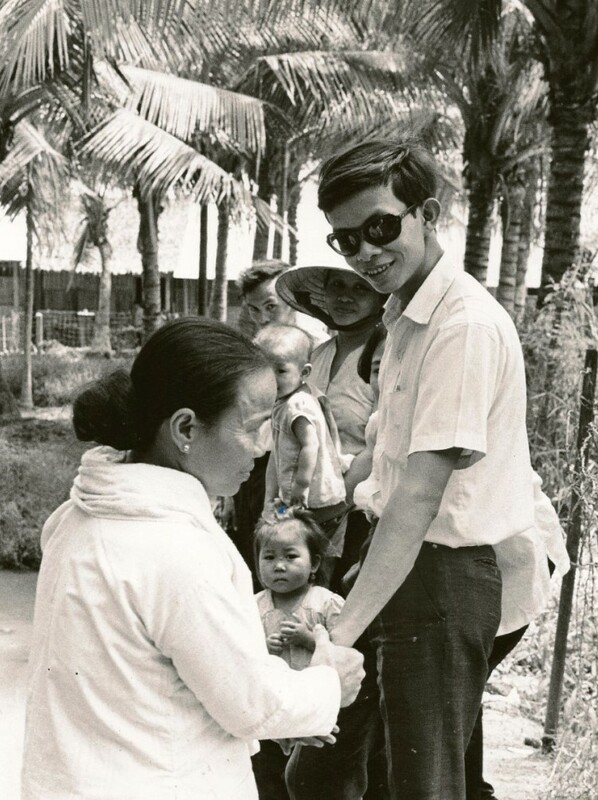 These last days, propaganda broadcasts from the Americans and their lackeys were continually spreading distorted news about the heroic achievements of the late celebrated Nguyen Van Be...During the day in the prison camp the public address system of the prison camp has loudly asked Nguyen Van Be to come and receive supplies sent by his family. The Americans and their lackeys wanted to give the captives the impression that Nguyen Van Be is still alive. National Liberation Front Committee My Tho Province, No. 500, 20 April 1968. As you can see, the Communists were horrified that their propaganda would be seen as a lie and made every effort to attack the American campaign as devious and false. There are more such documents, but I believe these are sufficient. On 10 May 1967 the United States dropped another 16.5 million Nguyen Van Be leaflets over North Vietnam. Echoes will be heard forever in the future about the deeds and name of Brother Be. They will be sung clearly and aloud. His name will soar up to the clouds and become a star. Along the shore of the Mekong River, there rose a hero, just 20 he was. Full of promise like spring coming to the countryside. How glorious he is, this Nguyen Van Be. His gentle countryside has become more beautiful because of him. As I said earlier, the Communist simply ignored the American leaflets and posters showing that Nguyen Be was alive. In 1967, they went to great pains to celebrate the first anniversary of his martyrs death. 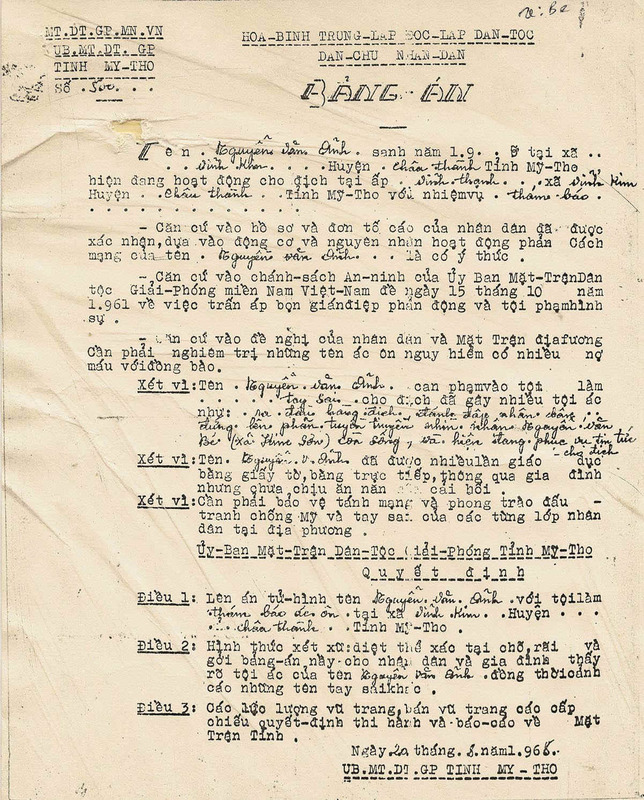 In preparation for the new program entitled Follow the examples of Nguyen Van Be and Nguyen Viet Xuan; improve the revolutionary spirit of attack; and resolutely carry out the counsels of Uncle Ho on the occasion of the first anniversary of hero Nguyen Van Be, the Central Group has coordinated with the Association of Musicians to emphasize the importance of promoting the writing of new songs using the subject of hero Nguyen Van Be. The paper goes on to say that a musical play entitled Three times a Hero has been written, also a short play entitled The Hero of Rach Gam and a group of comedians had created a comedy show about Be. 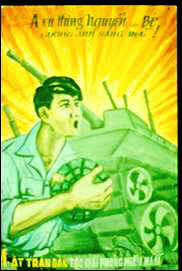 Two paintings of Be had been done by Vietnamese artists and they were in the process of producing an agitation propaganda poster. Two large statues of Be were being carved at the time of publication. 300,000 copies of the biography of Be were ready for sale. Finally, a number of short films and poems in his honor had been written. On that same day the U.S. dropped 10 million Nguyen Van Be leaflets over North Vietnam. With soaring emulative morale and desire to shoot down the 2,000th American aircraft, massive public rallies were held to commemorate the first anniversary of dead hero Nguyen Van Bes sacrifice. The same general message was read over Radio Hanoi that night. In another article the newspaper spoke of 104 Nguyen Van Be sewing machines in a factory and an Nguyen Van Be natural fertilizer plant. An article in Tien Phong dated 28 May 1967 told of a military convoy heading south bearing the name of Comrade Be. Apparently the young heros name was everywhere. The example of Comrade Be has helped me to see the truth of his glorious life. In know now that in the future, whatever task assigned me by the Party and the people and whatever the problems or risks, Ill fulfill that task in an outstanding way. It is because comrade Be is with me and will live forever deep in my heart. .Village is currently working for the enemy in Vinh Thanh Hamlet, Vinh Kim Village, Chau Thanh District, My Tho Province as a spy. Based on the recommendations of the local population and the local Front organization that we must severely punish dangerous enemy thugs who owe many blood debts to the people. 1. Nguyen Van Anh is hereby sentenced to death for the crime of serving as a criminal evil spy in Vinh Kim Village, Chau Thanh District, My Tho Province. 2. Method of Execution: He is to be executed on the spot and this sentence is to be distributed to the people and to his family to give them a clear picture of Nguyen Van Anhs crimes and also as a warning to other enemy lackeys. 3. Our armed forces and paramilitary forces are responsible for carrying out this sentence and reporting back to the Province Front Committee. However, avoid talking much about Be's family in order to minimize the damage already done by the enemy in case they succeed in "buying over" Be's family. 1. Continue to propagate the Nguyen Van Be story. 2. Organize a Commemoration Day on the Anniversary of Bes exploits. Much has been done by the Viet Cong to discredit the United States / Republic of Vietnam PSYOP program built around Nguyen Van Be as a martyred hero who died fighting the Americans. The fact that he had turned Hoi Chanh, cooperates with Allied Forces, has caused the Viet Cong much confusion and has hurt the credibility of their propaganda. An alert Vietnamese policeman heard this tale and had seen Be's picture on Viet Cong propaganda. A Viet Cong prisoner in the local jail, he noted, answered Be's description. Investigation disclosed that it was in fact Be, who knew nothing about his heroic exploits as told by the Communists...South Vietnamese information specialists have brought Be's true story to the attention of the world. Meanwhile, the Communists still try to convince the Vietnamese people that he is a hero and dead. Indicative of their desperation, the Communists have recently put a price on Nguyen Van Be's head, with the offer of a reward to the person who murders him. So how would the Communists revere the name of Comrade Be and attack the Allied story of his being alive? Here are some newspaper stories from Hanoi. 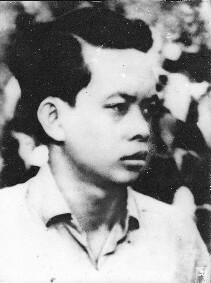 In July 1967, the Lao Dong Party offered a two million-piaster reward to any patriot who would assassinate the fake Nguyen Van Be. They also stated that any member of his family or neighbor who claimed that Be was alive would be killed on the spot. 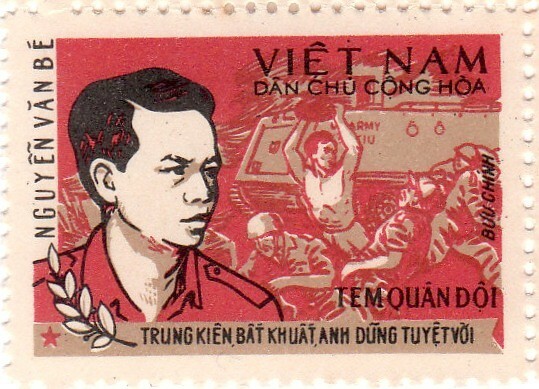 Nguyen Van Be appeared on several North Vietnamese stamps including a 15 February 1971 military stamp that depicted him attacking an American tank. The use of this military stamp is quite rare. There is also a civilian issue that is different in that it is denominated and bears the normal Dan chu Cong Hoa Viet Nam inscription. 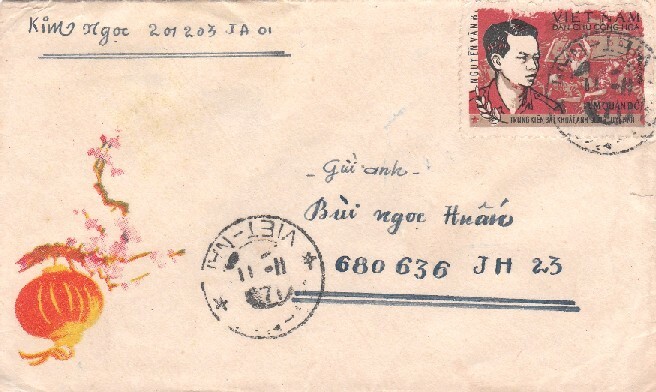 This letter was sent using the return code HT 201 203 JA 01 which is known to be the military post at Ba Vi, North Vietnam. The Americans continued to disseminate leaflets and other propaganda each year on 30 May, the date that Be was allegedly killed. It was all in vain. The Communists had succeeded in making most Vietnamese people believe that the real Be was dead and the current Be was an imposter. This is one of the very few cases where the lie was more powerful that the truth. While the North Vietnamese were denouncing the newly discovered Be in the South, the Vietnamese and their American counterparts formed a special Nguyen Be Task Force to exploit their discovery in roughly two phases. 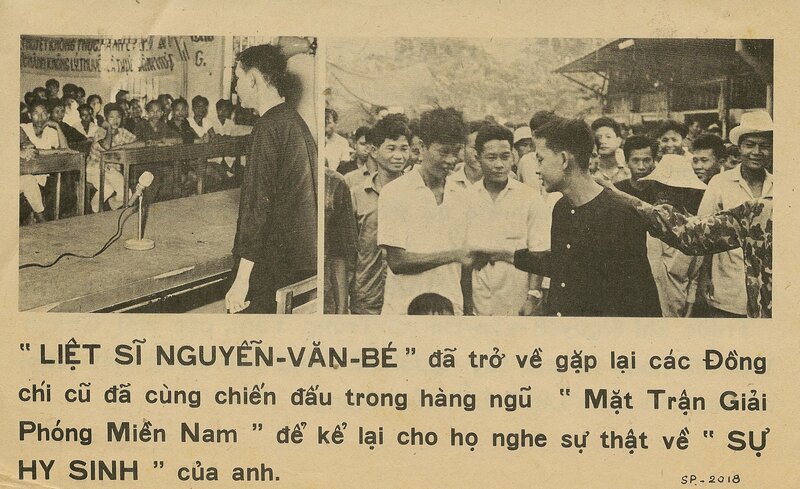 What later became the 'Nguyen Van Be Campaign,' consisted of an identification phase and an exploitation phase. For the first five months following the March 1967 press conference, Vietnamese propagandists aided by JUSPAO 'psywarriors,' were to simply identify Be in the minds of the target audiences. The exploitation phase occurred over a longer time with the propaganda thrust on Be's statements about the communist emulation system, his analysis of current communist propaganda, and his participation in various staged events. The plan for further exploitaton of Nguyen Van Be appears quite ambitious and thorough: however, it is not without risks. It should be noted, for example, that one of the effects of our expose of the Nguyen Van Be lie has been to stimulate the Communists to step up the Be emulation campaign, which is not to our advantage. Notice the table in front with the loudspeakers and the helicopters in the background. As soon as the choppers left, the activities to disown the Be legend would begin. Unfortunately, it turned out to be the wrong village. Then there was the big propaganda coup coordinated by every conceivable allied agency to take advantage of that fact that we discovered we had captured, sometime earlier, a simple VC cadre who turned out to be the same person who had been elevated to a folk hero status by Communist propaganda. As he was missing in action and presumed dead, they had fictionalized his self-sacrificing demise for the cause. A day-long operation was mounted including plenty of military security and helicopters to descend unannounced into his home village, in a VC-dominated area, to present him as a living lie to his fellow villagers while we fed them, entertained them, and gave them medical attention. To our chagrin, it turned out not to be his home village, though the peasants there recognized his name and fame. Next day we went back to our files to find out where we had gone wrong. The files concerning him, including posters, printed songs, maps, stories, etc., which were kept in an office just a few steps from mine, were completely cleaned out. My statement was meant to emphasize that someone in our own organization was a Viet Cong operative that cleaned out all our documentation on Nguyen Van Be. We were at a meeting at JUSPAO when we got the story about Be being found. I can remember Zorthians Number Two being very enthusiastic: Well never let them forget this! JUSPAO planned a big celebration Be returns to his village. There would be a welcoming banner over the entrance to the village, his mother would be greeted and honored, and all this would be observed and covered by the media. We knew about this at Battalion, and that a National Police force was sent out well in advance to secure the area. After the event, I happened across a U.S. reporter who asked if I had heard what happened. I told him No. Well, he said, they flew two planeloads of us out there and we followed Be and party into the village. The villagers didnt seem excited about Bes return, so I asked one if he didnt know who Be was? Yes, thats Nguyen Van Be. Hes from that village over there. (Whoops, wrong village!). Anyway, the reporter was less than happy and said it was the last time hed respond to a JUSPAO invite. In the ongoing propaganda battle that became known as the Hero Be affair, Peter Arnett reported the story as a psychological defeat for the South. Journalists, unaware of the reason, were sent to Bes village before noon on 21 April to cover his arrival. The homecoming of the dead Vietcong hero was elaborately staged today except for the final detail, according to Arnett. I am glad to be home amongst you, Be told puzzled villagers. Asked how many of the villagers he recognized, None, he responded. Arnett wrote, The covey of psychological warfare specialists, both American and Vietnamese, began looking concerned. Hero Be actually lived in another hamlet nearly 2.5 miles away. The psychological warfare officials suggested the mistake was made by hero Be himself. They said he had never before seen a map. Nonetheless, he had shown himself to be alive, hardly the defeat Arnett described. To counter the U.S. and Republic of Vietnam scheme in the Be affair, the Viet Cong turned to violence. The Front kidnapped several men who admitted knowing that Be was alive and put others on wanted lists. Some were reportedly killed for saying he was alive. 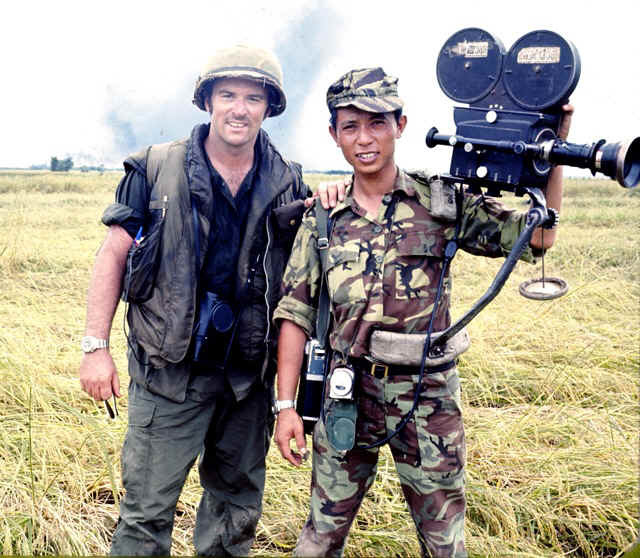 Don North with Vietnamese cameraman Ngia near Da Nang. 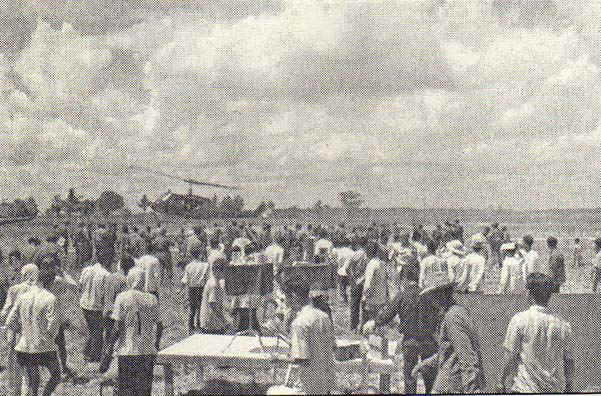 The Army filled two Huey helicopters with about thirty journalists from Saigon, which included all three networks and the major newswires and newspapers. We were already familiar with the Nguyen Van Be story since he and his family had been presented to journalists at the so-called Five O'clock Follies; the daily news briefings. Earlier that day four companies of the United States 9th Infantry Division had landed to secure Kim Son Village along with the Regional Forces stationed in and around the village. Loads of rice and gifts were brought in and distributed. There was a band and strolling musicians. A big attraction was a tent where Army medics extracted bad teeth and gave out medicine. A large crowd of villagers assembled around a makeshift stage and Nguyen Van Be was brought out with his family. He was greeted with puzzled stares. The Government Planning Director of PSYOP tried to generate enthusiasm for the miraculous return of Be, but nobody recognized him. Be had been taken to the right village but his own Hamlet was more than three kilometers away. One old man recognized Be as coming from another Hamlet. In rural areas like this there is little contact or transportation between Hamlets. The Army considered moving the troops to secure the correct Hamlet but it was too late in the day to mount a new operation. This was not a story that interested U.S. news agencies. They wanted war stories about American troops in combat. I don't think my story was ever broadcast in the United States on television. However the film should still be on file at ABC News in New York City. In all the JUSPAO meetings I attended, I rarely heard any discussion of why we were doing anything. It was almost always about how we were doing it. There were some exceptions, notably Don Rochlen, a maverick type with a real talent for bringing off public relations coups. I best remember his discovering that one of the leading Viet Cong martyrs was actually still alive. He organized an Army operation to bring him back to his home village to demonstrate he hadnt died heroically after all. It certainly did help to discredit the VC. Unfortunately, Stearman fails to realize that this attempt to bring Nguyen Van Be home was not a success. That was a big cheat! The North Vietnamese Affairs Office of the Joint United States Public Affairs Office (JUSPAO) in Saigon produced a leaflet coded "66." 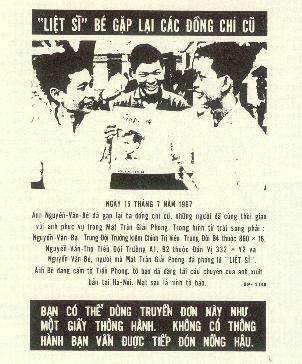 That number shows that The Allies disseminated the leaflet in the north during the time that the United States was bombing the Democratic Republic of Vietnam. The operations, named "Fact Sheet" and "Frantic Goat" took place from 1965 to 1968. A very strange story indeed. According to the Communists, Nguyen Van Be died a glorious death in the service of the cause. Supposedly, after the Army of Vietnam (ARVN) forces captured him, he detonated a mine killing himself and 69 Americans and Government of Vietnam troops. 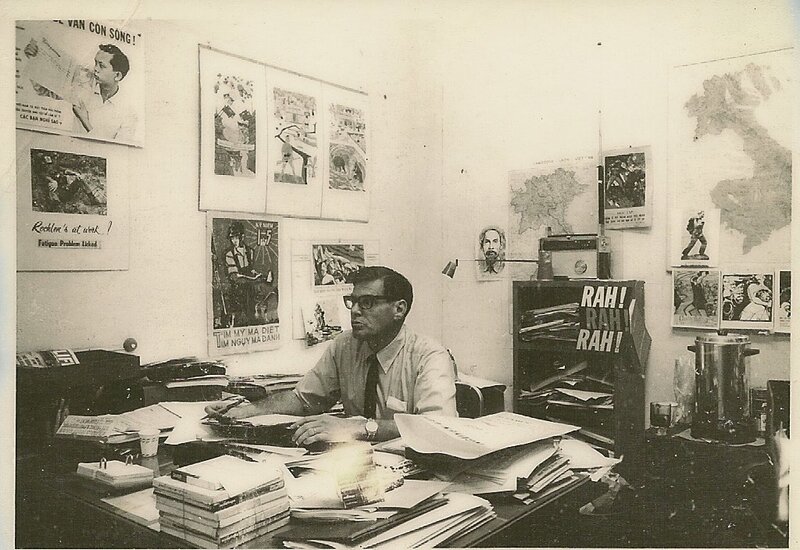 The Communist newspapers, Radio Hanoi and Liberation Radio printed and broadcast glowing accounts of his heroic death. Poets and musicians wrote and sang of his exploits. The government built a statue in his honor. However, as you can plainly see on the other side, he is very much alive. 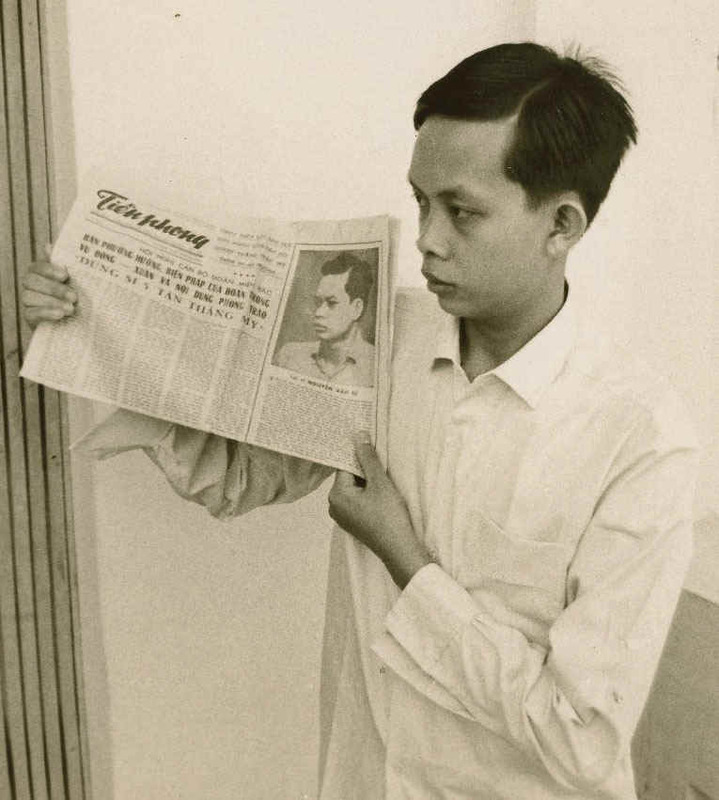 He is shown reading about his own death in the Hanoi newspaper Tien-phong of 7 December 1966. The Communists say he chose a hero's death. He says that he never fired a shot and did not even think about exploding a mine. The 'Late Hero' Nguyen Van Be reads about his own death and depicts Be reading the newspaper account. 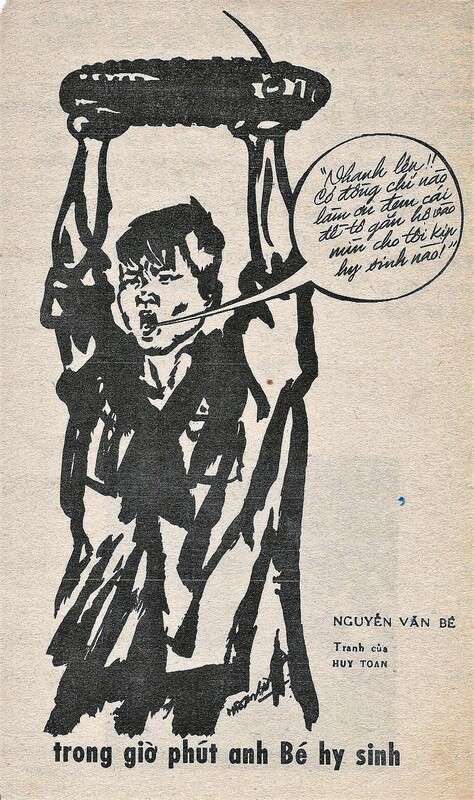 The leaflet on Nguyen van Be continues to be an irritant to the North Vietnamese. 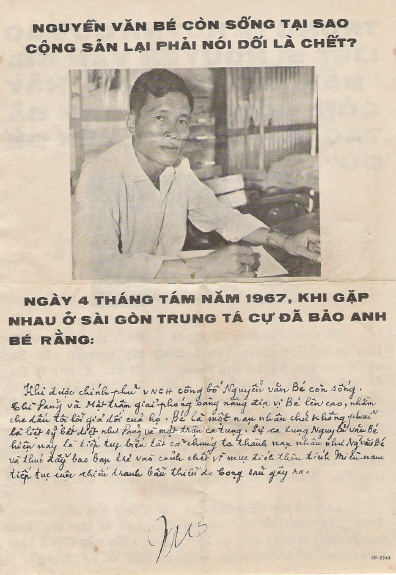 An editorial in the 14 April issue of Tien Phong Daily from Hanoi which was received here this week states in part: We all want to now, more about this young hero who represents a shining example, a proud expression of our generation, a source of fear and terror for the enemy who sought all dirty means to distort the spirit of his immortal war deed. The same issue of this paper featured a large picture of be on the front page along with the first chapter of a book telling his life history. This leaflet was dropped over Hanoi on April 10. 9,600,000 copies of leaflet number 66 which tells of Nguyen van Be were dropped over the area between the DMZ and Dong Hoi on May 17. 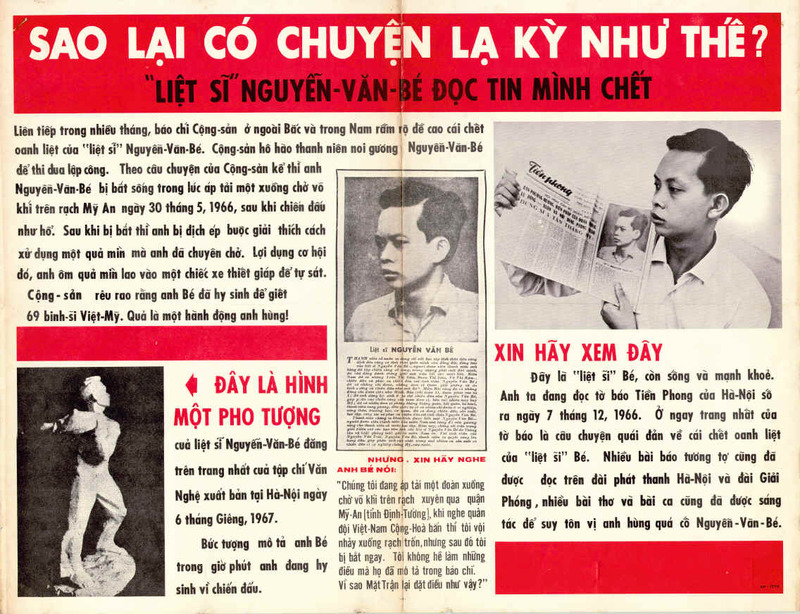 The leaflet unmasked the Communists deceitful propaganda because in reality, Be was still alive in South Vietnam and had presented himself several times before the press and addressed people on television. Truth is the best PSYOP. Colonel Fred Walker, United States Special Operations Command. Nguyen Van Be and Platoon Leader Nho. 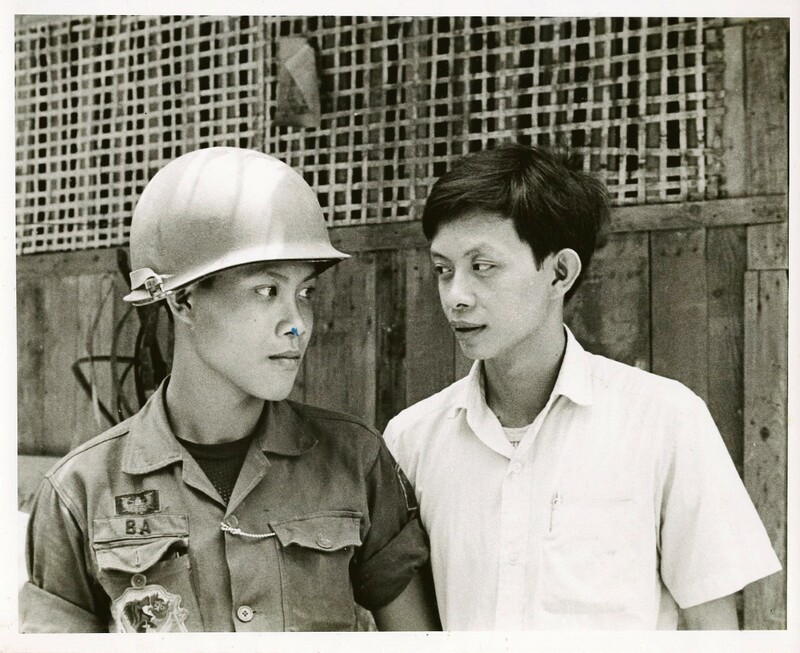 This photo, take in Saigon in July 1968, shows (on left) Tran Huy Nho, of Viet Yen, Ha Bac, leader of Platoon 1-C2, 2nd Battalion, Quyet Thang Regiment, who rallied to the national cause at Gia Dinh, near Saigon, 18 June 1968. 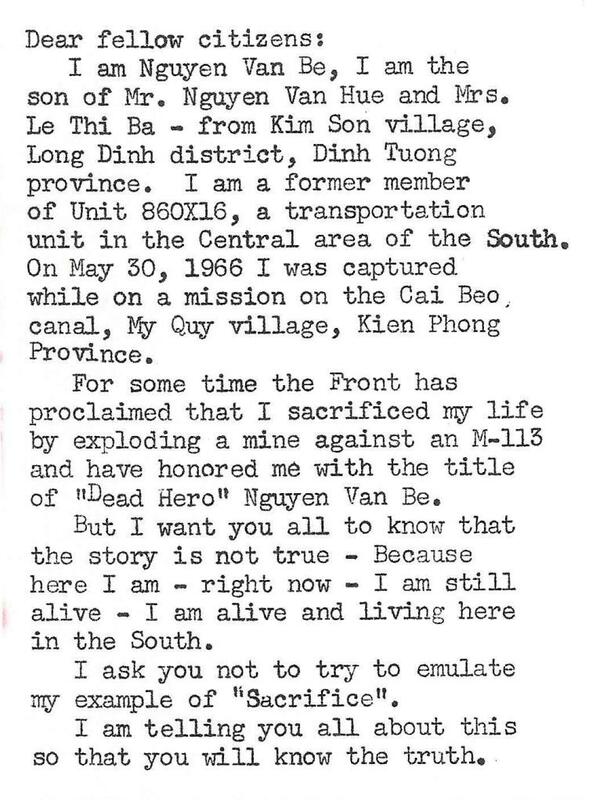 Platoon leader Nho and 54 NVA soldiers who rallied at the same time have addressed a letter to President Ho expressing sorrow that they had been misled by Lao Dong propaganda and stating that, in reality, the South is free, independent and more prosperous than the North. Platoon leader Nho was surprised to find that Nguyen Van Be, with whom he is shown chatting, is alive and well and a supporter of the national cause. Nho now understands that Lao Dong propagandists invented the story of Be's martyrdom for the purpose of encouraging other soldiers to sacrifice themselves. A photo of Be and Nho is at the left of the leaflet. Nguyen Van Be Exposes Lao Dong Propaganda. Two years ago Lao Dong propagandists were seeking ways to encourage young men to sacrifice themselves for the sake of the Party. Believing Nguyen Van Be had been killed at the Cai Beo Canal, they invented s story saying that he had been captured, tortured, and had killed himself and 69 allied soldiers by exploding a detonator against an armored vehicle. Even when it was revealed that be was alive and their story false, they insisted he was dead to cover their embarrassment. Nguyen Van Be is shown in the photo exposing the Lao Dong lie to some members of the Quyet Thang Regiment who rallied near Saigon on 18 June 1968. Actually, in military psychological operations (PsyOps), there is no game-playing. Truth is of the utmost importance to achieving the mission. The 'Late Hero' Nguyen Van Be reads about his own death. A very strange story indeed. According to the Communists, Nguyen Van Be died a glorious death in the service of the cause. Supposedly, after ARVN forces captured him he detonated a mine killing himself and 69 Americans and GVN troops. Glowing accounts of his death were printed in communist newspapers and read over Radio Hanoi and Liberation Radio. Many poems and songs were written about his exploits. A statue was even built in his honor. However, as can be plainly seen, Be is very much alive. 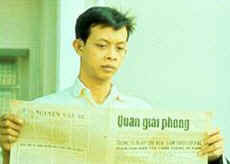 He is shown reading about his own death in the Hanoi newspaper Tien-phong. The Communists say he chose a hero's death. Be says that he never fired a shot and did not even think about exploding a mine. The hero is seen reading an article about his own death. Many communist newspapers loudly proclaimed that Nguyen Van Be was dead. However, the Hero was still alive and well. 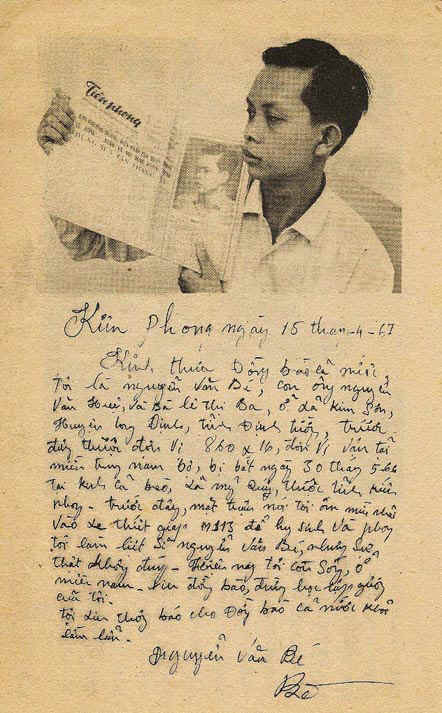 He is shown reading a 17 February 1966 article in Hanoi's Tien Phong newspaper describing his death. 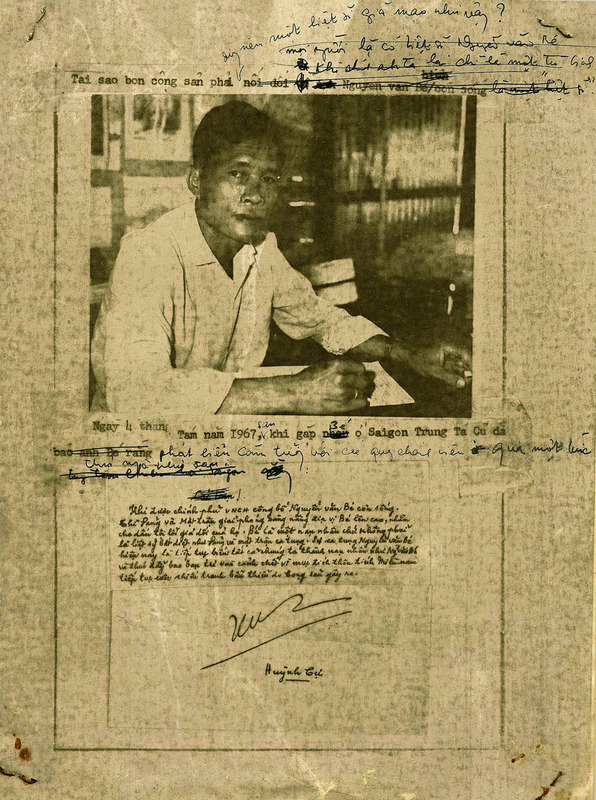 Similar articles were published in other Hanoi and NLF newspapers along with poems and songs written to glorify the story of this hero. When he heard people describe his acts of heroism, Be was very surprised because he had not done any of the things that were described in the article. PSYOP messages must remain truthful to maintain credibility; however, the impact on the target audience is only limited by the imagination of the PSYOP specialist, the staff, and the commander. The "late hero" Nguyen Van Be comes back to meet former Liberation soldiers to tell them the true story of his "Sacrifice." On March 31, 1967, at the National Chieu Hoi Center in Saigon, Nguyen Van Be fully told his own story of how he was captured. He spoke to some 300 Hoi Chanh who had to study Nguyen Van Be's bright example before they chose to return to the government side. Following his talk, Nguyen Van Be answered all questions put to him by the Hoi Chanhs. His meeting with them lasted nearly three hours. Before Nguyen Van Be left the center, crowds of Hoi Chanh came forward to personally greet and shake hands with the man whom the Communists have honored as their "dead hero." The party can make a newspaper hero, but it cannot admit a mistake. If you are really interested in reading closely, you can see the size of their error. Revolutionary heroism is a propaganda trick says LTC Huynh Cu, who trained 3000 National Liberation Front officers and noncommissioned officers. LTC Huynh Cu, former Chief of the Viet Cong Training Section, Military Region Five, who returned to the Government of the Republic of Vietnam on 24 March 1967 at Son-Trung camp, Son Tinh district, Quang Ngai province. Seeing Nguyen Van Be on 4 August, he related to him all the tricks of the Liberation Front of the South is using with his name, his home village and his unit to cheat the other young men. Nguyen Van Be burst out laughing when hearing LTC Huynh Cu tell him about his marvelous death. As a military man who served with Communist cadres more than twenty years, I know well how they have to manipulate all of us to achieve their objectives. The only reality for them is that which will serve their interests. When I was training director for MR 5 I heard the story of Be's heroism. I doubted the story. However, I knew the importance of making men die for the cause so I kept quiet. After returning to the government I met Be and found that he had done nothing but let himself be captured. No heroics, no slogan shouting, no nothing. Now that the government has revealed this, the Communists must shout his heroism all the louder. Do you know why? Be is a victim, not a heroic soldier! The Communists are trying to make victims of us all. I feel it is my duty to save my comrades from emulating such false heroics. of the leaflet message because they demand attention. Psychological Operations Field Manual No.33-1" published in August 1979 by Department of the Army Headquarters in Washington DC. Now that you are still living, you have created a big problem' LTC Huynh Cu tells dead martyr Nguyen Van Be. 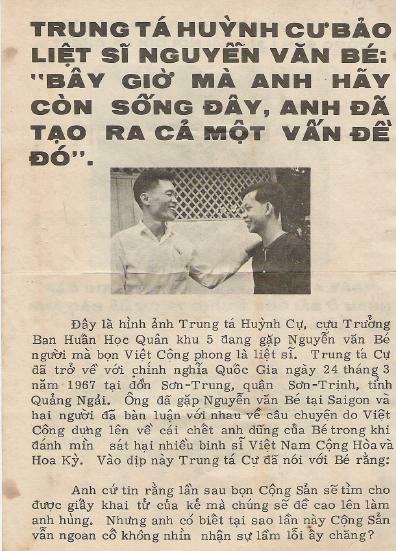 Here, LTC Huynh Cu, former Chief of the Viet Cong Training Section, Military Region Five, meets Nguyen Van Be who the communists claim is a dead hero. LTC Cu returned to the Government of the Republic of Vietnam on 24 March 1967 at Son-Trung Post, Son-Trinh district, Quang Ngai province. He met Nguyen Van Be in Saigon where they discussed the communist story of Be's heroic death while blowing up ARVN and American soldiers with a mine. Cu told Be at the time: Believe me, next time the Viet Cong will have to look for a death certificate when they want to honor somebody as a hero. Do you know why they persist in denying their mistake? Why must the communists lie about the living Nguyen Van Be? LTC Cu tells Nguyen Van Be at their meeting in Saigon on 4 August 1967: Having made a major hero out of you, the Viet Cong must now deny that you live. They must say that you are a bogus Be, a creature of fiction created by the Americans. They have built a major propaganda campaign on you and now that you are alive, the fact of your existence may destroy and refute an entire set of arguments. I have copious files of data on these leaflets and I seldom add technical information so as not to bore the reader. I think I will add some additional information here so you can see that we know a lot about these drops. According to my files the leaflet is called LTC Cu and Nguyen Van Be and 5,000,000 copies were ordered by the 6th PSYOP Battalion in November 1967 to be printed by the 7th PSYOP Group on Okinawa designated priority 1 cargo. They were to be sent to Da Nang (2,500,000), Nha Trang (500,000) Pleiku (500,000), Ben Hoa (1,000,000) and Can To (500,000). Last paragraph of Vietnamese text on side one makes no sense. A revised paragraph has been written and is attached. Please use revision. There are three such changes and comments in this document so it becomes clear that although the text was allegedly written by the Vietnamese defectors, it was certainly suggested and honed by the Americans. Do not write the testimonial for the Hoi Chanh. A version written by a U.S. PSYOP officer or a Chieu Hoi cadre man probably will be recognized as bogus. It is permissible to suggest themes to the returnees, but the language must be his own. The best approach is for the Hoi Chanh to address his letter specifically to his former unit and address some of his former comrades by name. The entire mental conditioning of NVA troops, pursued through political indoctrination sessions, the three-man cell system and constant exhortation by the cadre, aims at achieving automatic responses reflecting the communist party view of word issues. This rote learning becomes a powerful cohesive element. It can be chipped at only by repeated discoveries that what has been studied and accepted as gospel truth does not accord with visible facts in the soldier's personal experience. JUSPAO next produced three consecutive leaflets on the theme of Nguyen Van Be. They are coded 2003, 2004, and 2005. 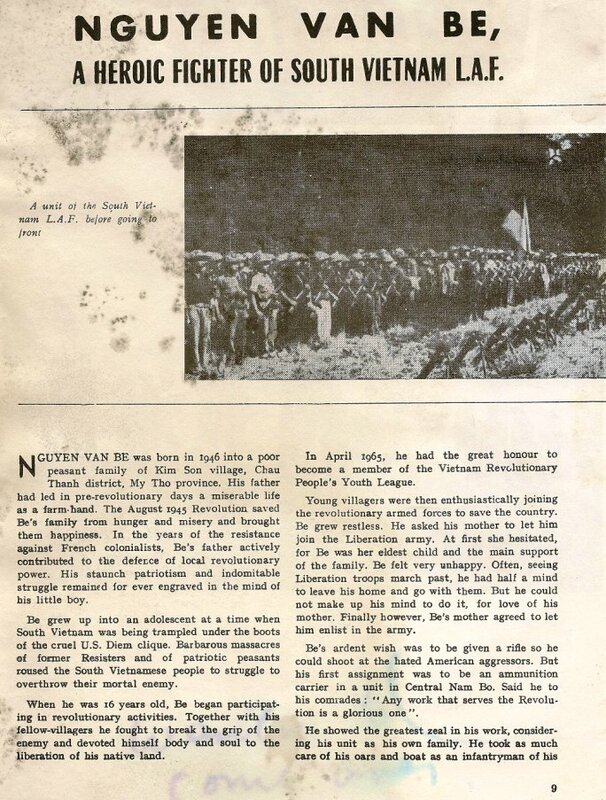 Why does The National Liberation Front stubbornly continue to say that Nguyen Van Be sacrificed his life when he burst a mine in order to kill 69 people on 30 May 1966? 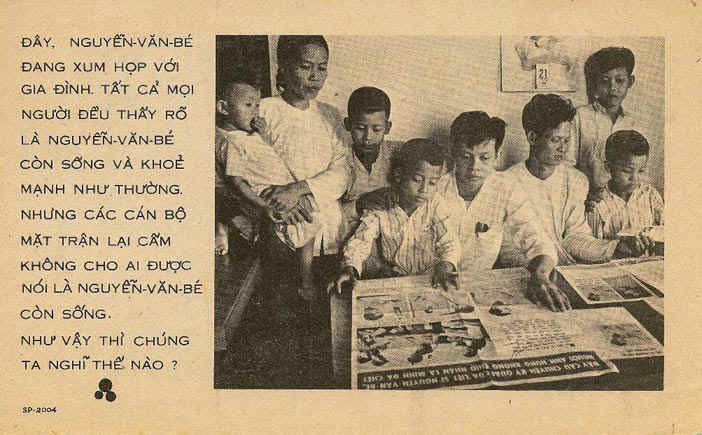 In the above picture, Nguyen Van Be is holding the Vanguard Newspaper that was published in Hanoi. Nguyen Van Be's portrait is featured in this newspaper, but he has the name "Hero Nguyen Van Be." The truth is very clear. Everyone can see that Nguyen Van Be is still alive. So, why does the National Liberation Front keep saying that Nguyen Van Be is dead? Do all the people understand why the National Liberation Front does this? To all my compatriots throughout the country: My name is Nguyen Van Be. I am the son of Mr. Nguyen Van Hieu and Mrs. Le Thi Ba of Kim Son Village, Long Dinh District, Dinh Tuong Province. I was previously assigned to Unit 860 x 16, a transportation unit of the Central Cochin China Region [Military Region 8, also called T-2]. I was captured on 30 May 1966 at the Ca Beo Canal, My Quy Village in Kien Phong Province. Previously the Front said that I had jumped into an M-113 armored personnel carrier clutching an explosive charge to my chest and called me "Martyr Nguyen Van Be," but that is not correct. I am still alive and living in South Vietnam. My compatriots, I implore you not to study me to follow my example. I am informing all my compatriots throughout our country of this so that there is no misunderstanding of me. 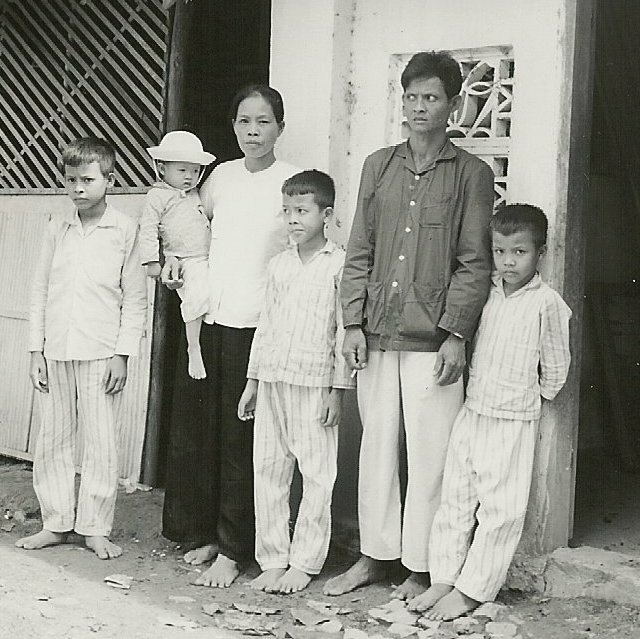 Here, Nguyen Van Be unites with his family. As everyone can clearly see, Nguyen Van Be is as strong and alive as he was before. However, the cadres of the National Liberation Front have forbidden anyone from saying that Nguyen Van be is still alive. Why is the Liberation Front afraid to let people speak the truth? 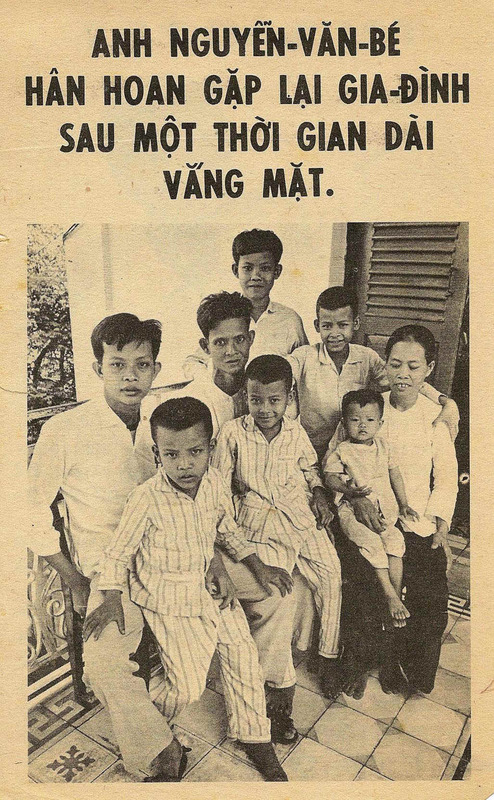 Nguyen Van Be is alive, well, and shown here with his family. As anyone can see, Nguyen Van Be did not sacrifice himself. Why are you not permitted to speak the truth? To the people living in the area of Kim Son Village. Have courage. In your hearts, you know the truth, Nguyen Van Be lives. His family knows he lives. Everyone knows he lives. Yes, even the front cadre who forbid you to speak the truth. Even they know he is alive. You can see the truth in the eyes of the cadre. Why do you think the front must continue to say that Nguyen Van Be is dead? Have courage; nothing can change the truth in your heart. The key is always to tell the truth, and never promise something we cannot deliver. Once we have credibility, then we have an effective message that will win over propaganda and stories told by other factions. 310th PSYOP Company, Bamian, Afghanistan. HOW COULD SUCH A STRANGE THING HAPPEN? THE LATE "HERO" NGUYEN VAN BE READS ABOUT HIS OWN DEATH. For many months, the communist newspapers in both North and South Vietnam have been telling everyone the fantastic story about the supreme sacrifice of the 'hero' Nguyen Van Be. Communist youth throughout Vietnam have been urged to emulate him. According to the communist story Be was captured on 30 May 1966 after fighting like a tiger to defend the arms and ammunition he was helping to transport along a canal near My An. Supposedly he was later forced to explain how a new mine worked, and seizing the opportunity he exploded it with his own hands against an armored vehicle. The communists claimed that be gladly gave his life for the cause and killed 69 Americans and ARVN troops. A heroic act indeed! This photograph of a statue built in honor of the 'late hero' was published on the front page of the Hanoi newspaper Van Nghe on 6 January 1967. It is supposed to show Be at the moment he sacrificed his life. But, read what Mr. Be has to say: 'We were convoying ammunition along a canal in the My An district. When I heard the Government of Vietnam shots, I plunged into the canal. I was captured after I jumped into the water. I never did any of the things they say I did. Why would the Front say such things?' Look at this: Here is the 'dead hero' alive and well. 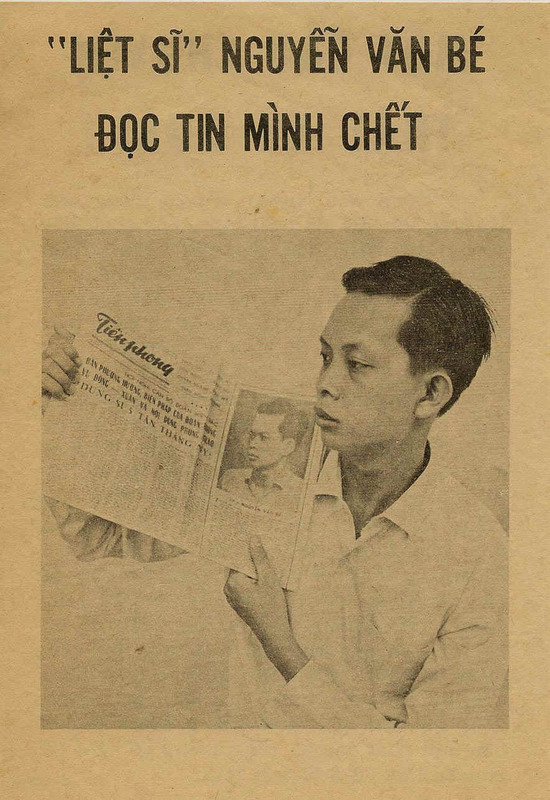 He is reading about his own death in the important Hanoi newspaper Tien Phong that carried the fantastic story on the front of the 7 December 1966 issue. Similar stories were broadcast over Radio Hanoi and Liberation Radio, and many poems and songs were written about the 'late hero' Nguyen Van Be. Psychological Operations soldiers use persuasion to influence perceptions and encourage desired behavior. The cornerstone of PSYOP is truth, credibly presented to convince a given audience to cease resistance or take actions favorable to friendly forces. U. S. Army Civil Affairs and Psychological Operations Command Missions and Functions. NGUYEN VAN BE IS STILL ALIVE! The man whom the Lao Dong Party of the North and the National Liberation Front of the South proclaim as a dead hero is in fact very much alive. However, the Front still insists that he is dead, and urges all youth to emulate his example. 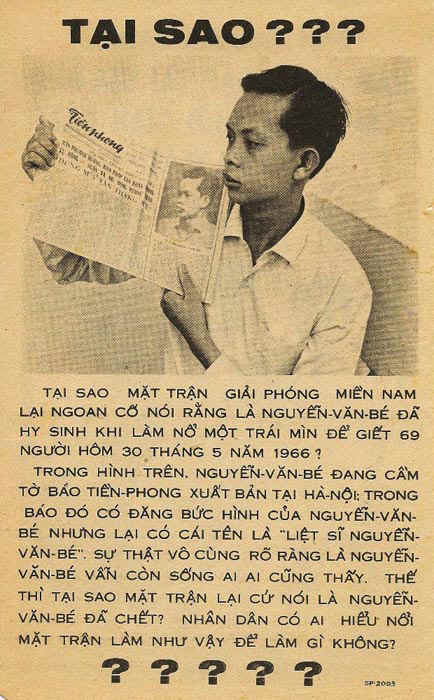 Yet, here is Nguyen Van Be holding the newspaper that describes him as the 'late hero' who sacrificed his life. Why does the Lao Dong Party and the National Liberation Front make up such a strange story? What do you think? 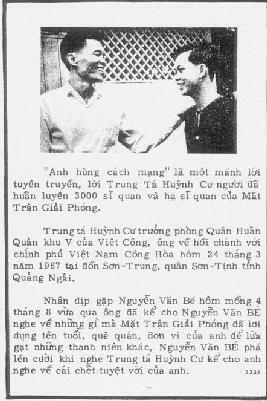 A tape statement by Nguyen Van Ba, former platoon leader, political officer, and cousin of Nguyen Van Be. In this message, Ba (a Hoi Chanh) reminisces about classes he conducted for the members of Nguyen Van Be's unit to inspire then to emulate Be. Upon learning that Be was alive he realized the hoax that had been perpetrated by the Viet Cong. He also compares living under Viet Cong control as opposed to Government of Vietnam control, and speaks of the Chieu Hoi program urging his former comrades to rally to the just cause. 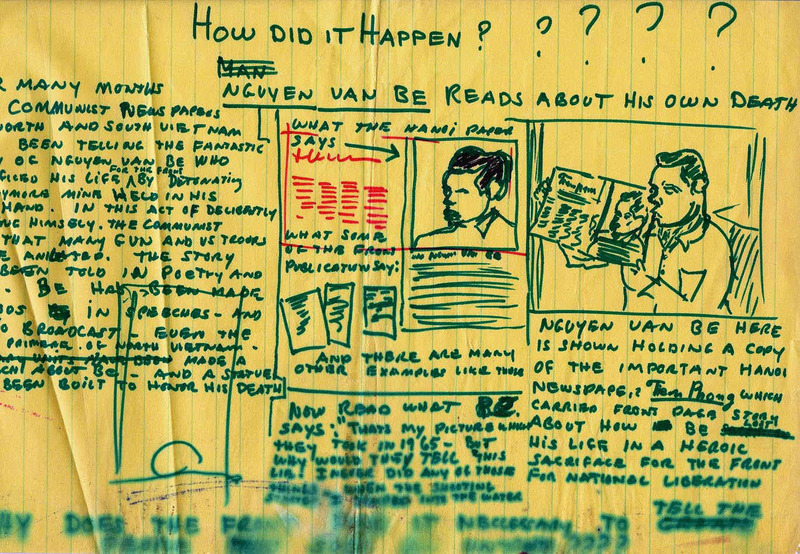 A tape statement by Nguyen Van Tho, former National Liberation Front sabotage expert who knew Nguyen Van Be. This (a Hoi Chanh) reminisces about former hardships shared with his friends in the 322 x 12 unit. He recalls classes conducted on dead hero Nguyen Van Be and then states Be is alive and he has seen him with his own eyes. He also emphatically states that in a technical sense of the word it would have been impossible for Be to have exploded the mine against the armored personnel carrier as the National Liberation Front has described the event. He then requests that his friends meet him on the path to rally. Tape statement by Le Van Hue, squad leader from the same transportation company as Nguyen Van Be. Hue states that he has rallied to the just national cause and is living a happy life. He compares his happy life with the hardships he suffered in the Viet Cong ranks. He also exposes the lies told by the National Liberation Front, which promised land and assistance to fighters in the Front. He discussed the Chieu Hoi program, and insures his former compatriots that if they rally they will receive good treatment. 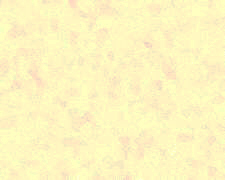 Hue assures his friends that Be is alive and well, that he has seen Be, that he had been captured and not killed, as stated by the Front. He urges his former comrades to rally to the just cause. Dear Fellow Citizens, I am Nguyen Van Be. I am the son of Mr. Nguyen Van Hue and Mrs. Le Thi Ba from Kim Son village, Long Binh district, Dinh Tuong province. I am a former member of Unit 860 x 16, a transportation unit in the central area of the South. On 30 May 1966, I was captured while on a mission on the Cai Beo canal, My Quy village, Kien Phong province. For some time the Front has proclaimed that I sacrificed my life by exploding a mine against an M-113 troop carrier, and have honored me with the title of 'dead hero' Nguyen Van Be. However, I want you all to know that the story is not true, because here I am, right now. I am still alive. I am alive and living here in the South. I ask you not to emulate my example of 'sacrifice.' I am telling you all about this so that you will know the truth. Looking through JUSPAO files I noticed this very short typed script. I searched to see if this was from a leaflet, poster or tape. This is the script used on tape 120. Perhaps we should take a moment and look at the responsibilities of the Transportation Platoon as explained by Le Van Hue, a friend of Be from the same unit who later defected to the National Government. We transported weapons, ammunition, land mines, water mines and Bangalores to our units in Central Vietnam. A sampan can carry about 300 kilograms of supply. We usually had from three to five sampans each trip. One platoon can transport about two tons of supplies. We got the supplies in Cambodia in Soai Rieng province. There were two piers there. They were brought by buffalo carts that could carry about 900 kilograms and we placed them in the sampans. We made three trips a month. Nguyen Van Be Invalid Veteran Pay Book? 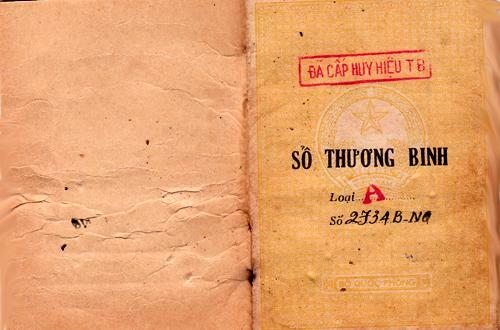 Robert Munshower discovered this Invalid Veteran pay book in the name of Nguyen Van Be while researching his history. I must state here that we are not sure this is the same individual, the name is not uncommon in Vietnam and this could be another young Viet Cong soldier with the same name as the revolutionary hero. Nguyen Van Be is an extremely popular name for Vietnamese males, especially those who are born in rural areas. However, his military record and time of injury match up fairly well with the Communist propaganda story of Be. Although we are not 100% positive that this is THE Nguyen Van Be, I believe we must depict portions of the book. 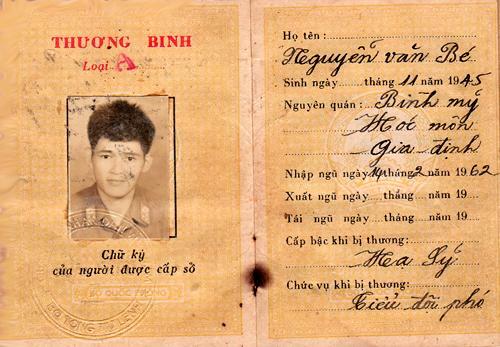 The Nguyen Van Be in this booklet was born November 1945 at Binh My Village, Hoc Mon District, Gia Dinh Province, and enlisted 14 February 1962. His rank when injured was Corporal (Deputy Squad leader) in unit C2D4E2F9. His was wounded in combat at Xa Cat, Binh Long. He spent 3 months and 3 days in a Viet Cong hospital, and was considered 35% disabled, Class 2, with a monthly stipend of 39 dong. 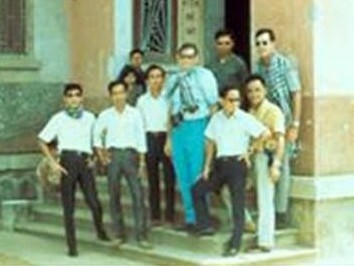 Nguyen Van Be is at the bottom right in white shirt and sunglasses. Captain Bob Turner of the Joint United States Public Affairs Office is above him in blue checkered shirt leaning against the wall. 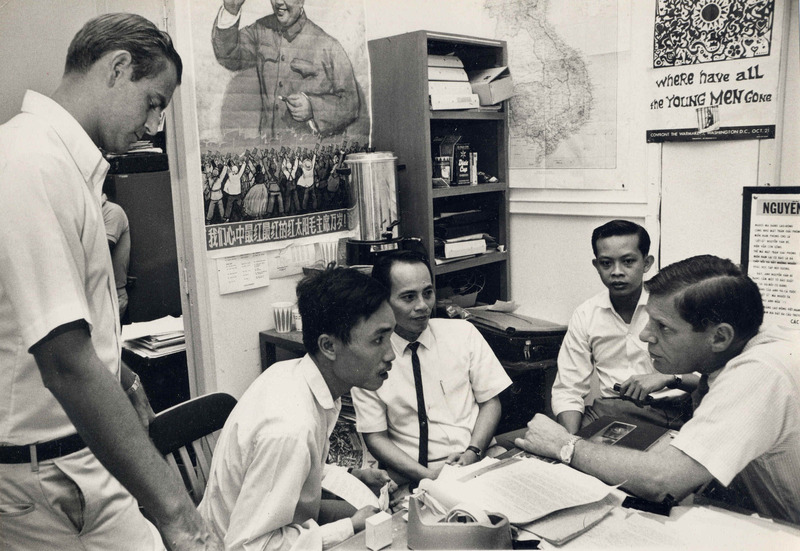 The man in the center with blue pants is Don Rochlen, a psychological Operations Advisor of the United States Information Agency and the Southeast Asia Treaty Organization who worked with JUSPAO. Propaganda, to be effective, must be not only factually true, but credible. Sykewar, Daniel Lerner, George W. Stewart, NY., 1949. This story of PSYOP intrigue is interesting because it seems to defy all the laws and logic of psychological operations. We have shown over and over again that the rules of PSYOP demand that (except in the cases of a disinformation campaign) the text of the propaganda message be truthful and credible. Yet, in the case of Nguyen Van Be the communists were shown to be liars. Repeatedly the Allied leaflets and posters pointed out that the communists had lied to the people. The result should have been a complete loss in credibility by the Vietnamese in communist propaganda. However, the old adage about the "big Lie" seems to have worked in the enemy's favor in this case. 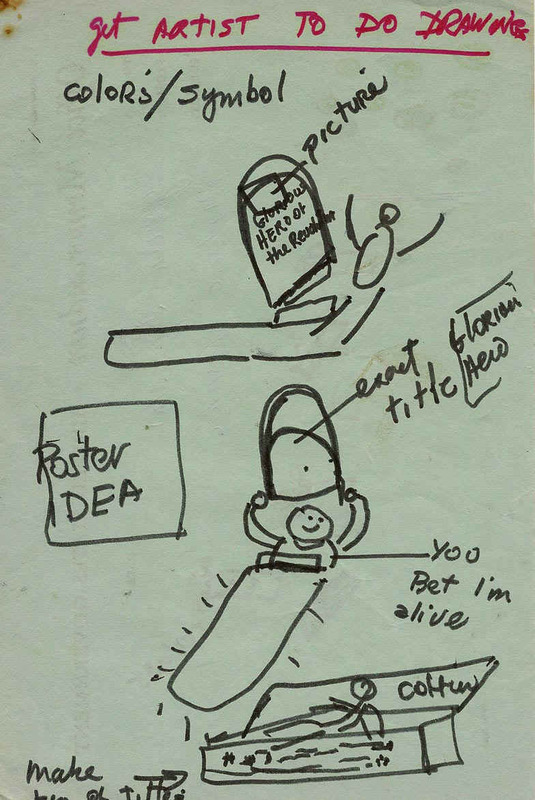 It is rare that we get to see the early concept drawings for a propaganda campaign. I have about a half-dozen drawings that were considered for this campaign and I depict two of them here. The first is overly simple and silly and it is clear why this was never made into a leaflet. Nguyen Be is depicted semi-buried in the ground holding a sign saying You bet I am alive. This was not good propaganda. The concept is much more thought-out and very similar to a number of leaflets that were printed. It uses the vignette of Nguyen Be holding the newspaper reporting his death that is found on many of the printed and disseminated leaflets. The magnitude of a lie always contains a certain factor of credibility, since the great masses of the people in the very bottom of their hearts tend to be corrupted rather than consciously and purposely evil, and that, therefore, in view of the primitive simplicity of their minds they more easily fall a victim to a big lie than to a little one, since they themselves lie in little things, but would be ashamed of lies that were too big. Hanoi and the National Liberation Front controlled what their people heard and read. They spent several hours each day in the indoctrination of their troops. Every time the Allies pointed out the lie, the cadre counterattacked. They said that the GVN and the Americans were the liars, and that the fake Be was a figment of their imagination, an actor treated with plastic surgery who just pretended to be their dead hero. This would appear to be a case where the truth did not conquer. The big lie seems to have reigned supreme. This is one of the oldest pictures I have seen of Be, taken just a few years before the fall of South Vietnam. The year is 1971 and Be is with his brother Ba, who is a member of the Army of the Republic of Vietnam. Ba is wearing an Armor qualification patch above his name tag and is believed to have been a member of their 3th Cavalry Squadron, equipped with M113 armored personnel carriers (APCs). What is Ba thinking? What may be the most interesting aspect of this story is that experts who have traveled to Vietnam can find very few streets that bear the name of the alleged hero, Nguyen Van Be. One resident told me No Nguyen Van Be Street here in Ho Chi Minh City that I know of but my Vietnamese map site finds one in Vinh Long and also one near Ban Me Thout in Dak Lak Province. The communists honored all of their military heroes with streets and buildings named or renamed for them. It may be that even as they lied and propagandized their own people with tales of Bes heroism, they secretly fumed at having been duped and waited for the first opportunity to erase him and make him a "non-person" in the best Communist tradition. 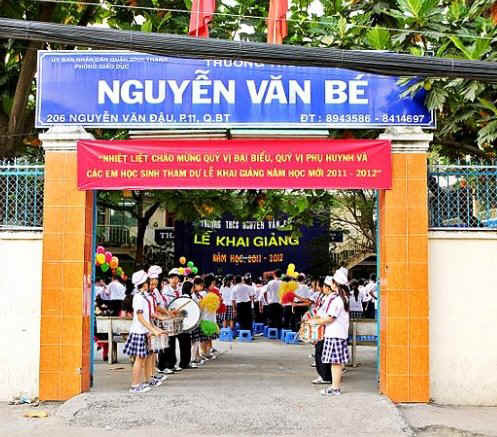 One source claims that as late as 1975 Bes name was still being placed on a street and a secondary school in the town of Long Khanh, but shortly afterwards the school name was changed. Sony Nguyen told me in 2012 that some of the streets had been changed only recently. It is possible that in some parts of Vietnam, the ability to use the Internet and perhaps read this article alerted some local mayors to the fact that Be was not the hero they believe him to be. It is shocking that it took them 40 years to learn the truth. We dont know much about Bes later life. We do not know if he was just absorbed into the new Communist state or sent to a re-education camp. According to the Vietnam Wikipedia Encyclopedia, Nguyen Van Be lived to well after the war and finally died on 24 March 2002. Ten years after I wrote this article I found an old copy of the CORDs booklet The Story of the Kit Carson Scouts. It tells of an occurrence on 1 July 1966, when a Viet Cong Squad Leader names Ngo Van Bay walked into the HQ of the 9th Marine Regiment. He had served two years as a Main Force Guerrilla. He was interrogated and then should have been sent to a Chieu Hoi Center. He was big, forceful, and a born leader and apparently impressed the Marines. Intelligence discovered that the VC had told the people of his home hamlet Cam Van, that Bay had been captured, tortured and killed by the Marines. They were spreading the story around the surrounding hamlets. Bay agreed to go with the Marines to his hamlet to tell the truth of his defection. They brought along a loudspeaker and he told the people that the Viet Cong had lied and he had been treated well by the Marines. He said that they could be trusted. He walked among the people, handed out cigarettes and let them touch him and his new clothes to see that he was real. This operation was so successful that Bay was never sent to a Chieu Hoi Center. Instead, he became the very first Kit Carson Scout in October 1966, and was assigned to the 1st Marines in the Da Nang area. The Scouts later became very famous and were used by the Marines for the rest of the war.